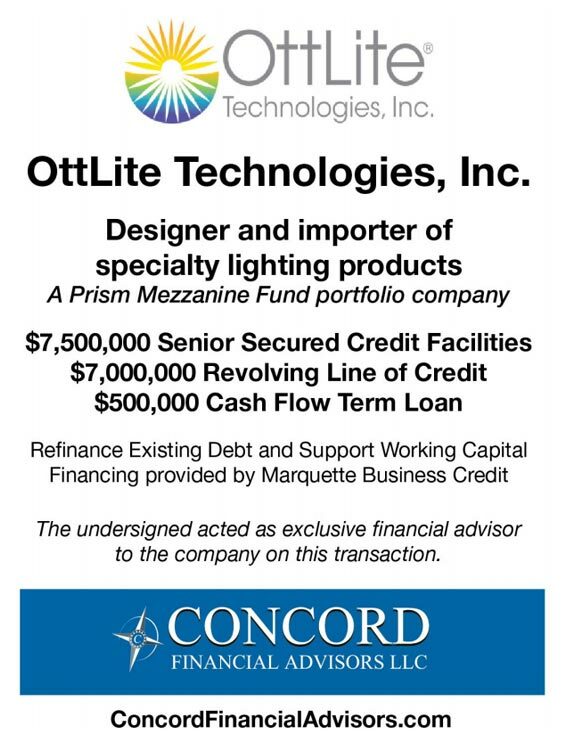 We source the most creative financing solutions with optimal terms from lenders that understand our clients' businesses, resulting in significant savings of time and money for our clients. 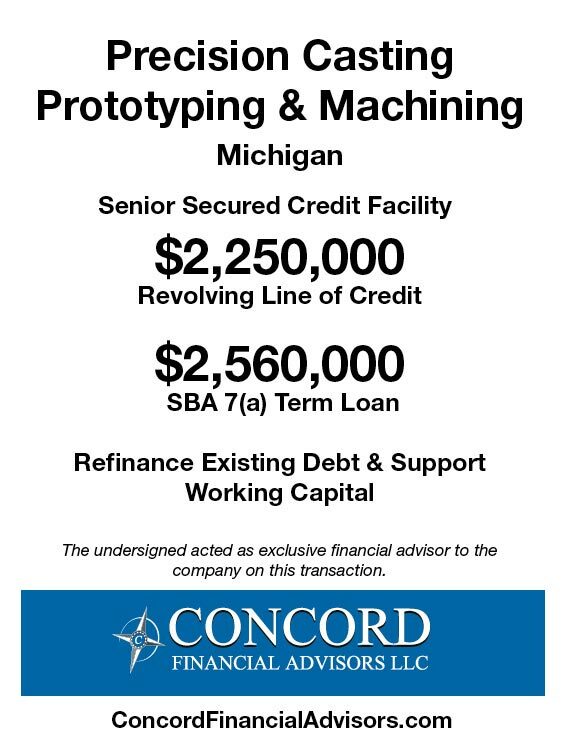 Our proven process saves our clients significant time and money by procuring the most appropriate financing structure. 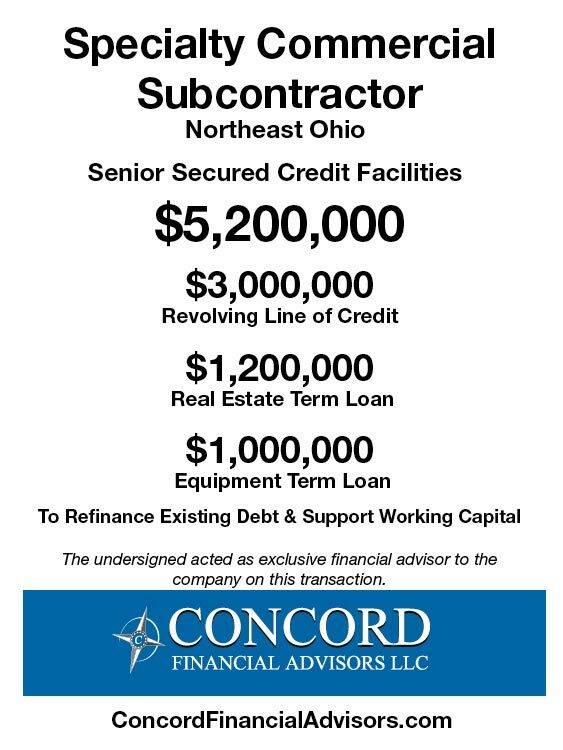 Concord has successfully closed over 95% of our retained assignments since our founding in 2001. 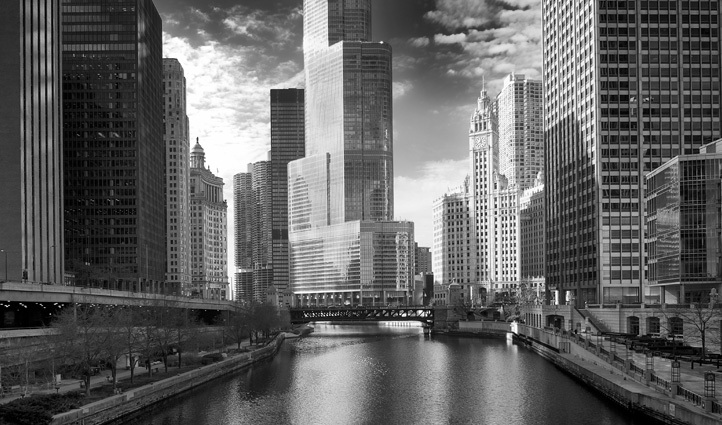 Considering the challenges faced by many of our clients, our proven track record demonstrates our ability to deliver unparalleled results. 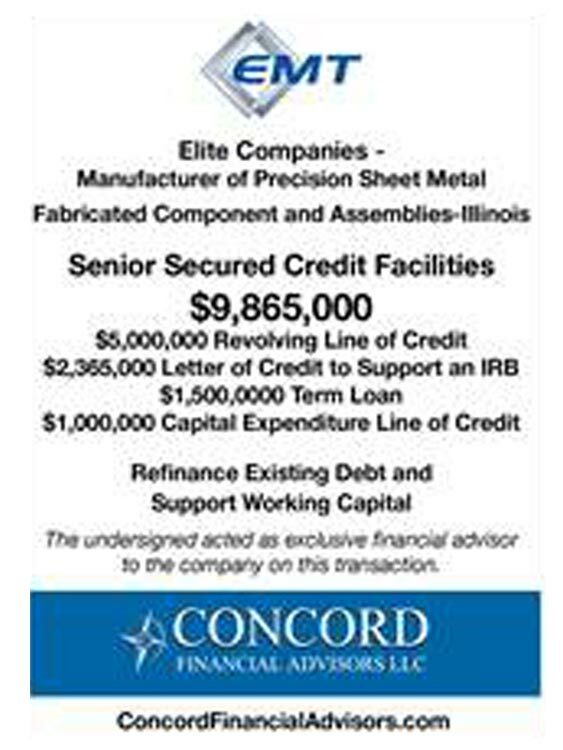 The Concord team has over 100 years of combined corporate finance experience. 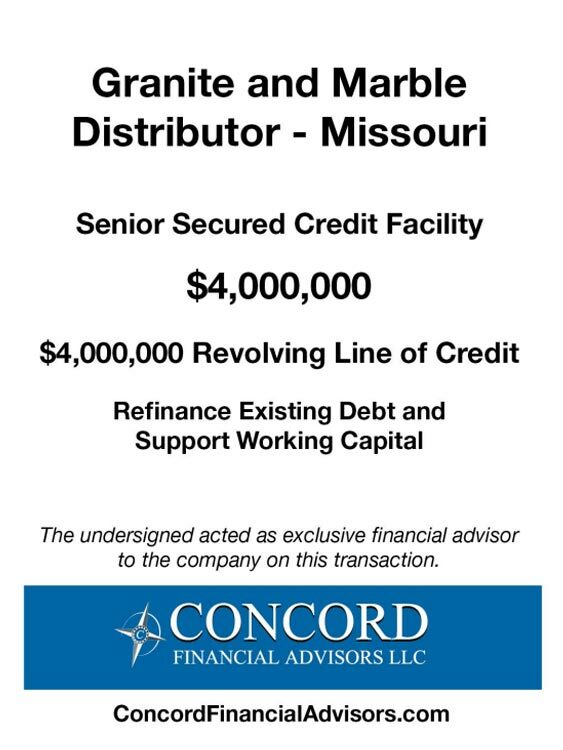 Watch the Video above to discover how we can help your company when no one else can. 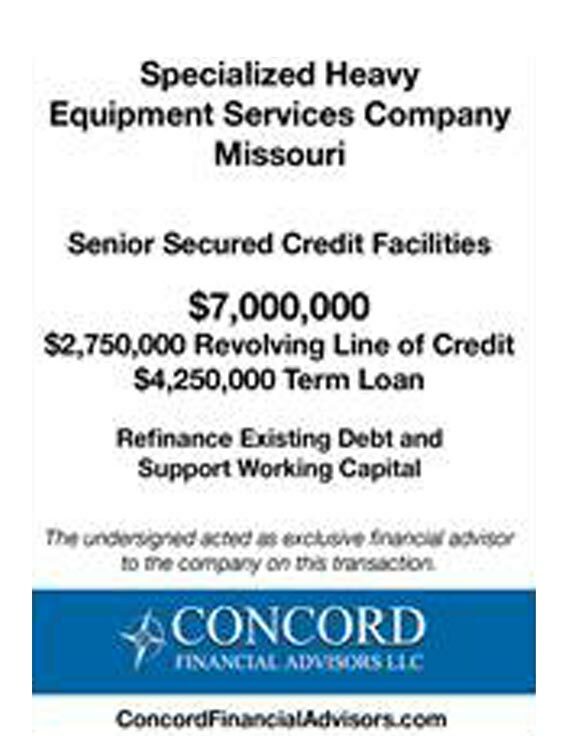 Concord Financial Advisors offers a one-stop approach to meeting your company’s unique financial needs. 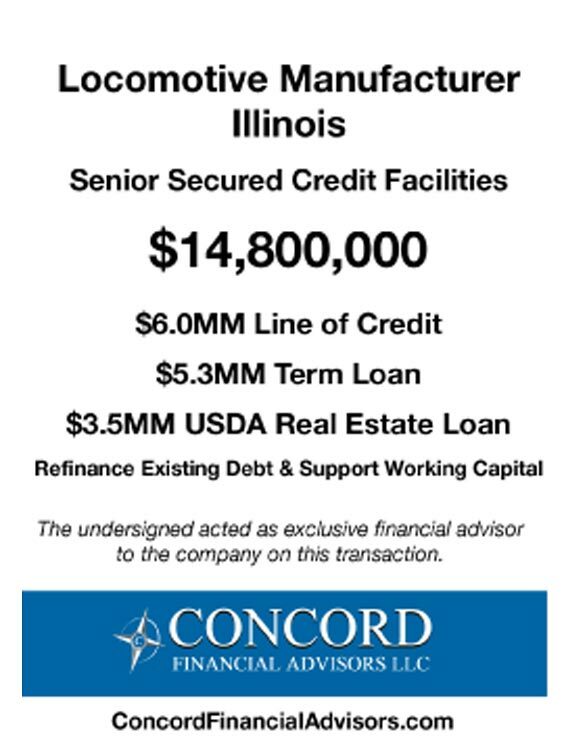 We manage the entire transaction, beginning with providing market feedback including an upfront screening of the transaction with potential lenders at no cost to our prospective clients. 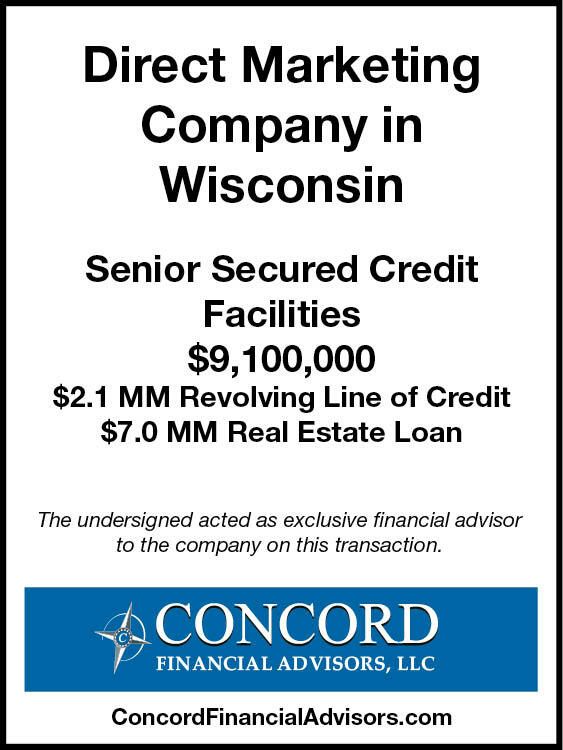 Concord was a true partner and identified qualified lenders that understand our business and negotiated the terms and structure of our lending arrangement with our new lender. 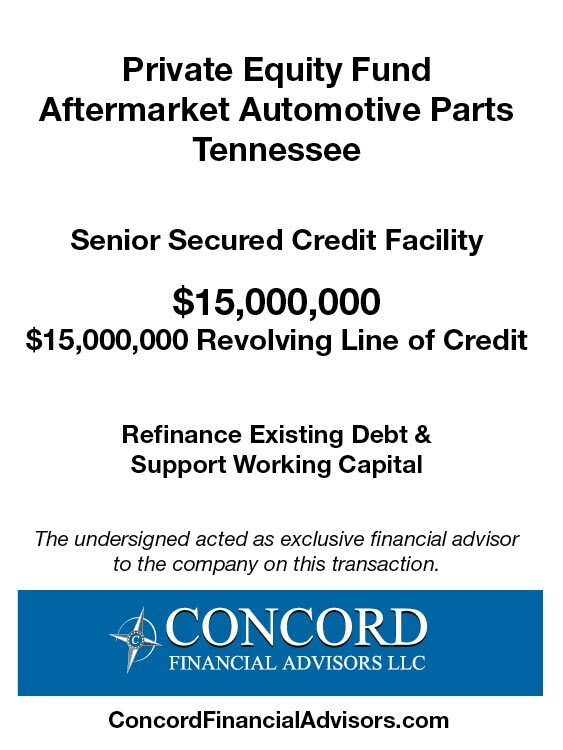 We are extremely pleased with the work ethic, strategic input and results provided by Concord. 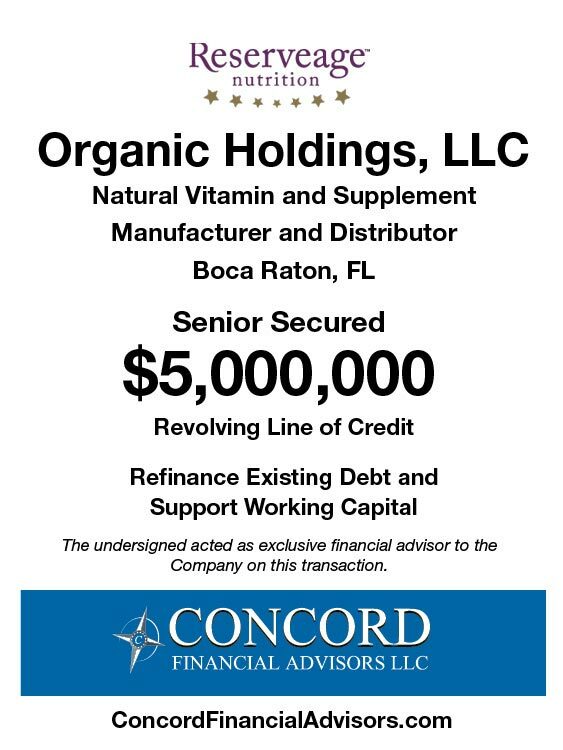 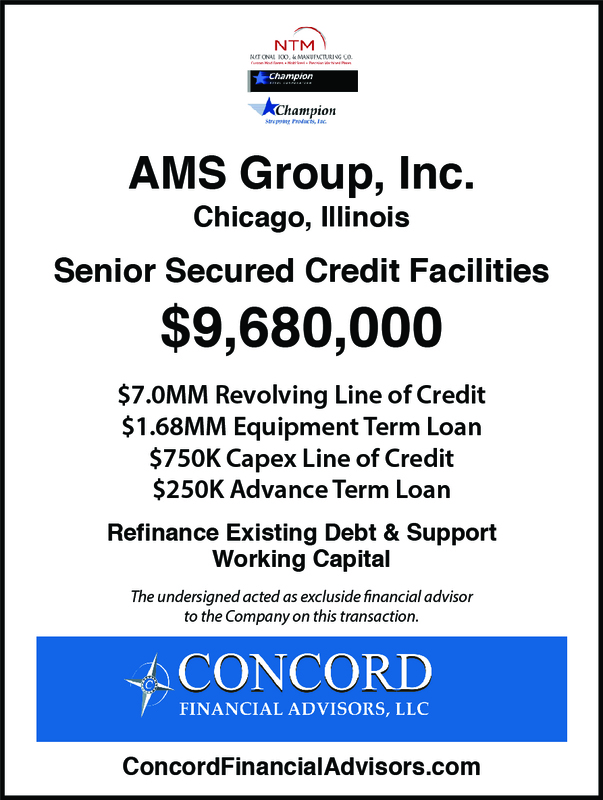 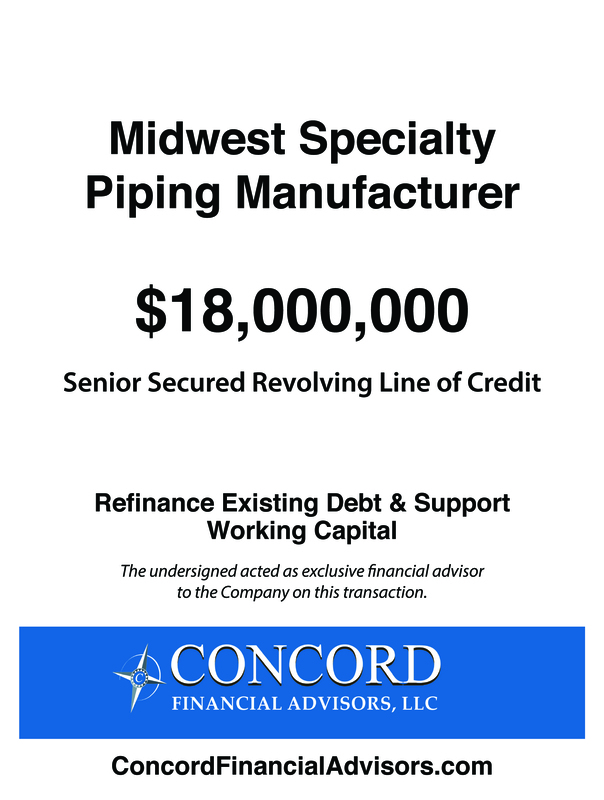 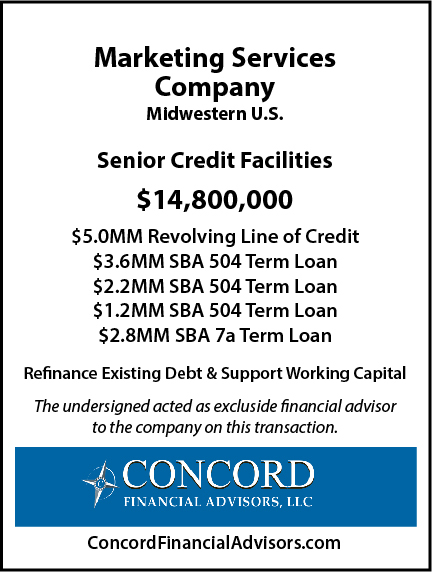 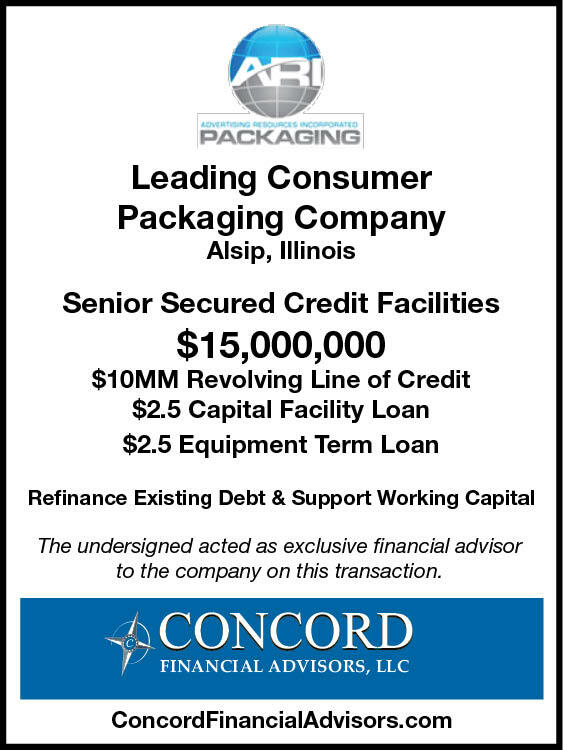 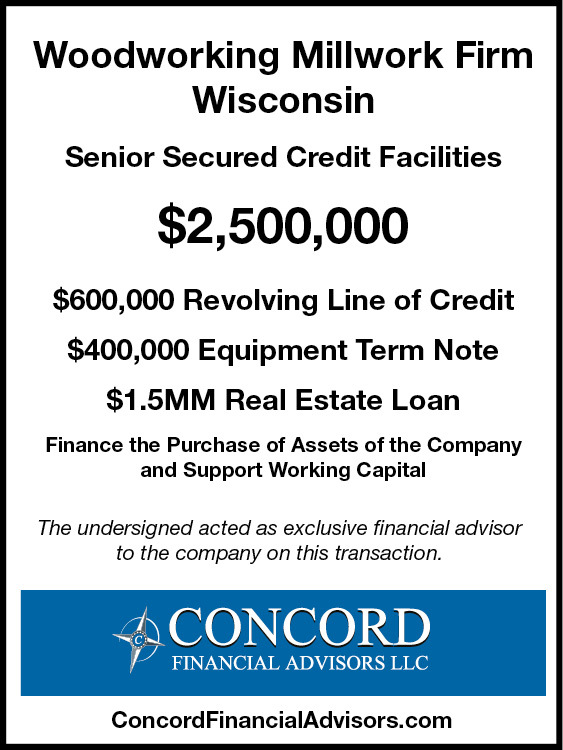 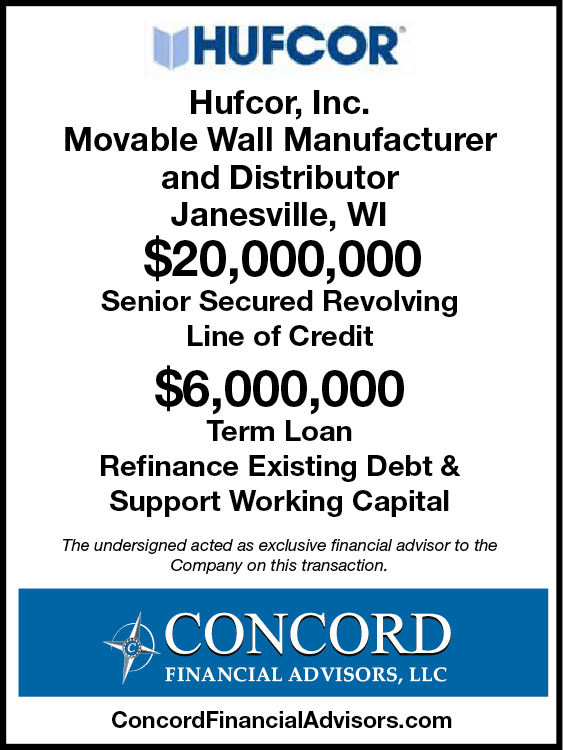 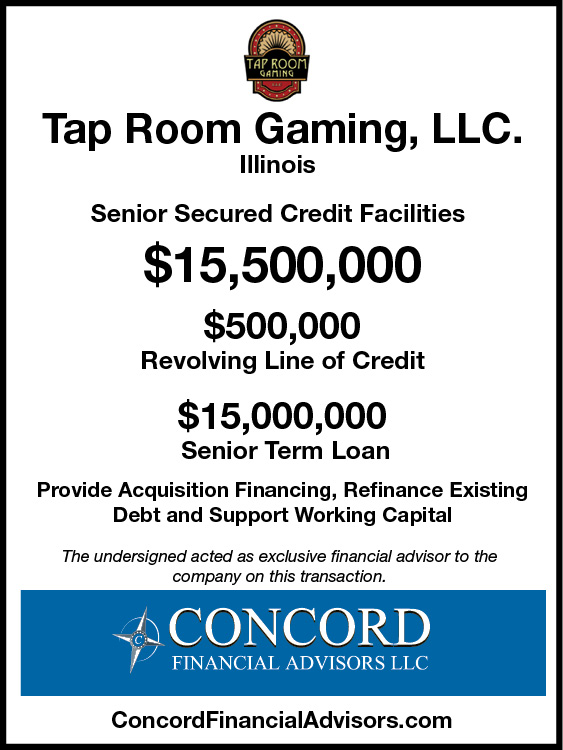 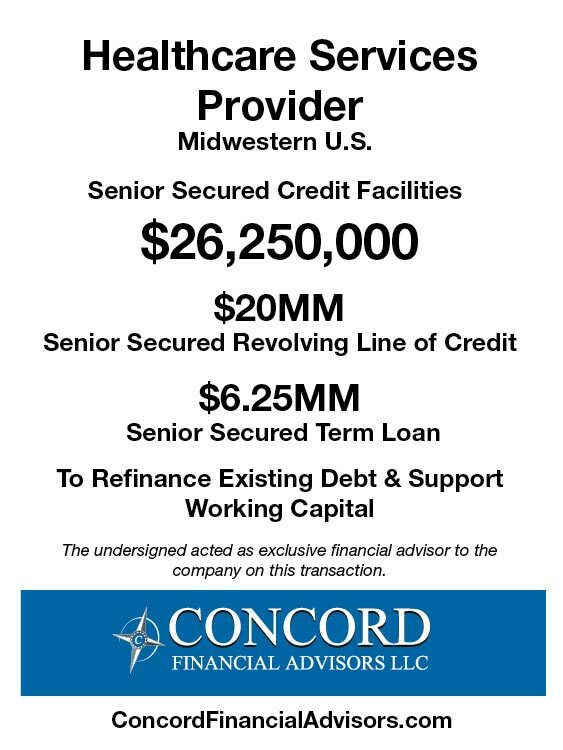 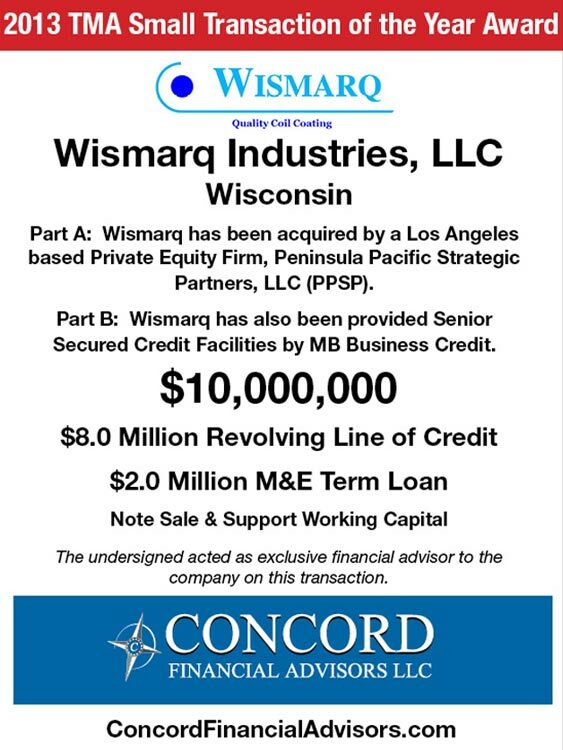 Concord’s relationships in the senior credit markets were instrumental in securing a new credit facility. 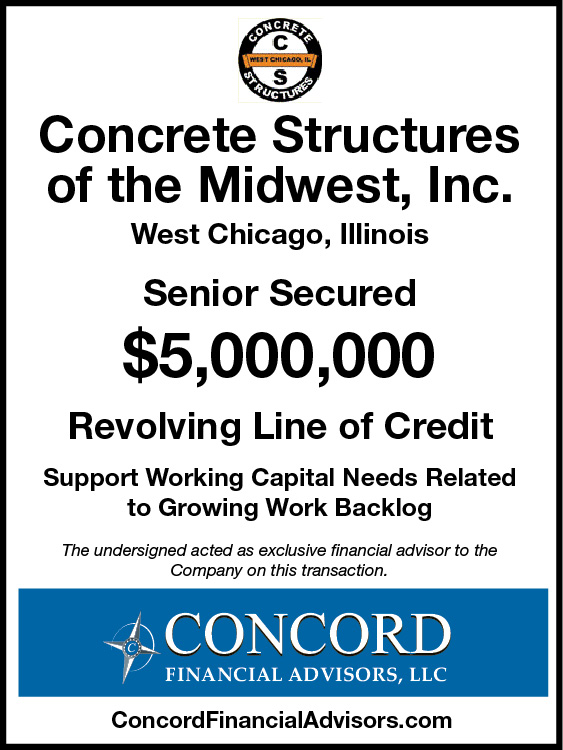 They guided us through the entire process and proved invaluable to our team. 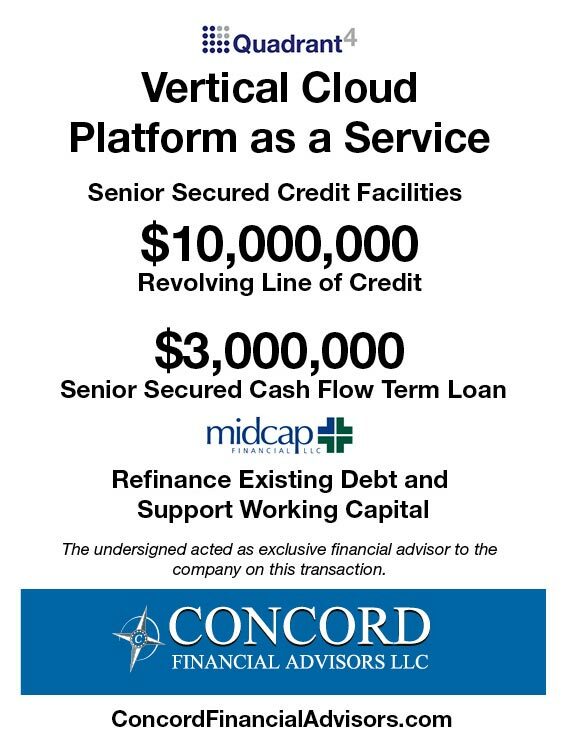 We are extremely happy with the new senior facility, and look forward to growing our business in partnership with the Midcap Financial, LLC team. 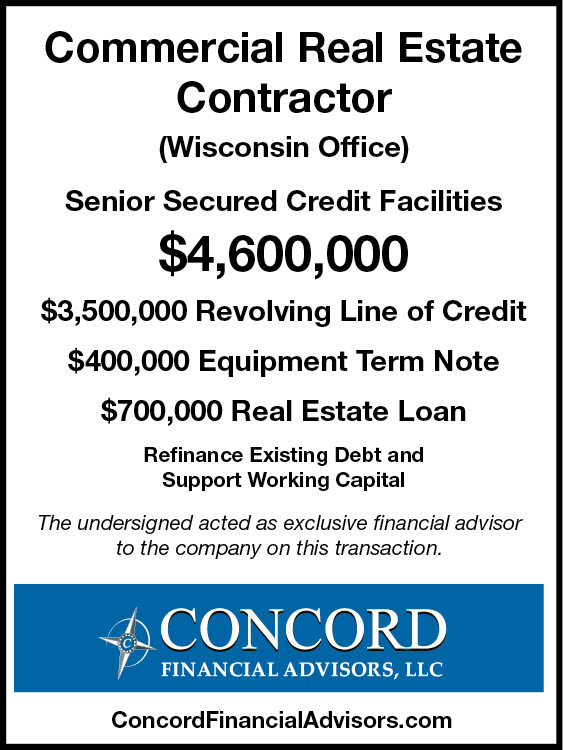 Concord’s process was very efficient and allowed Vista-Pro Management to concentrate on running the business. 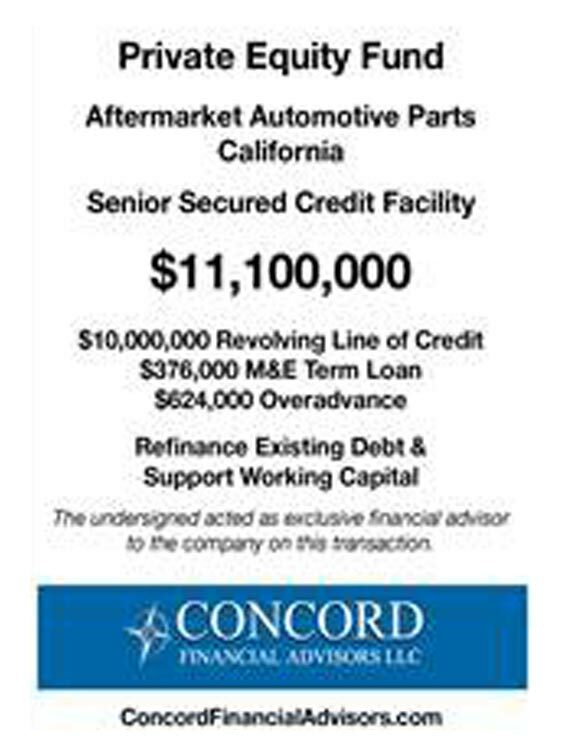 Concord quickly identified the most appropriate lenders for this refinancing and saved our team a lot of valuable time. 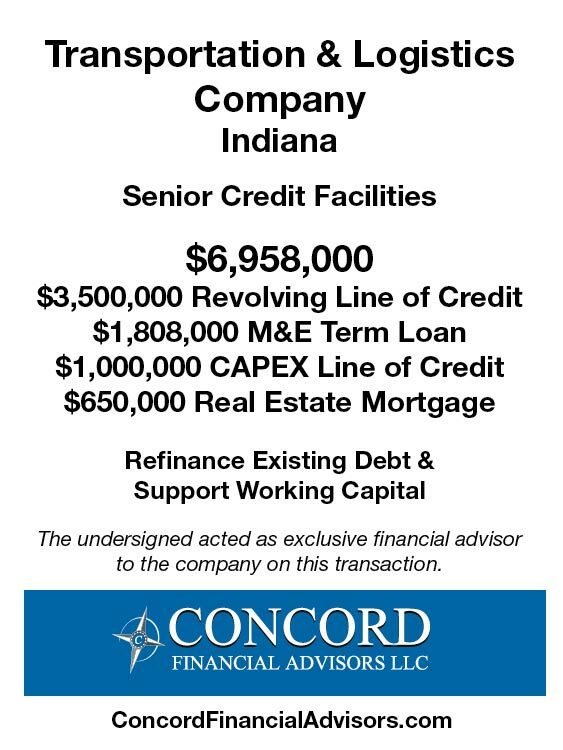 We are very happy with our new Senior Lender and with Concord’s process. 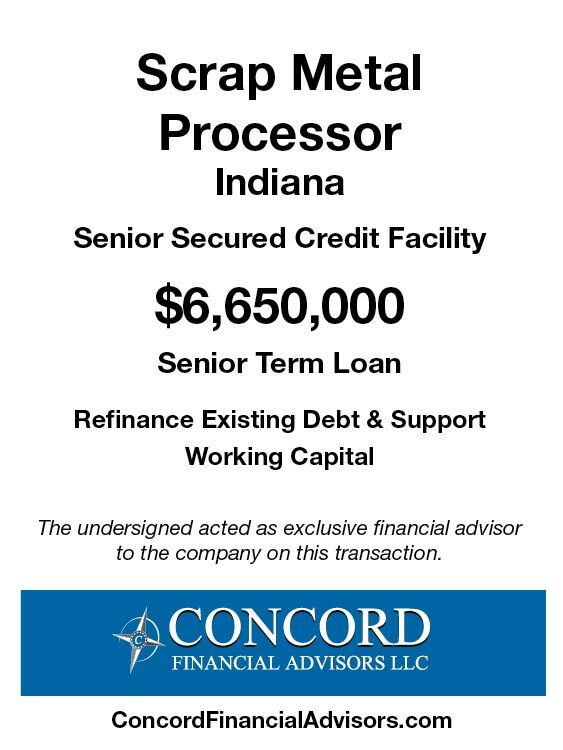 Concord saved us a significant amount of time and money by running an efficient transaction process that quickly identified the right lenders for our newly acquired business. 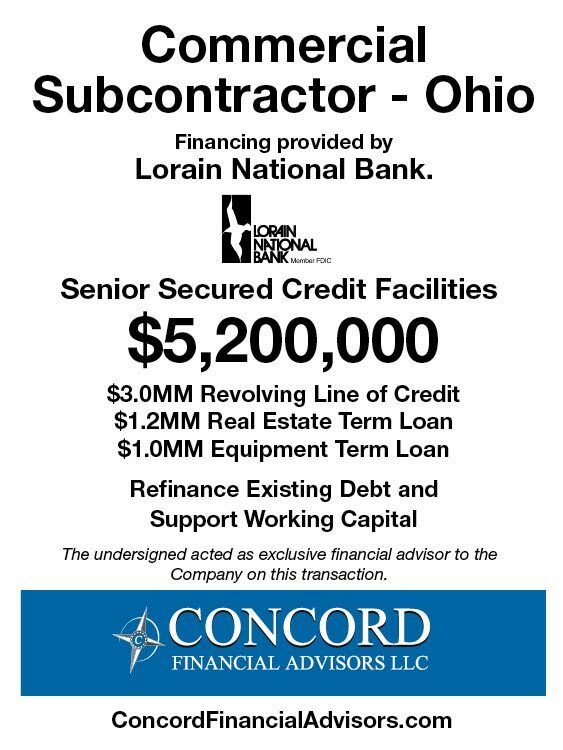 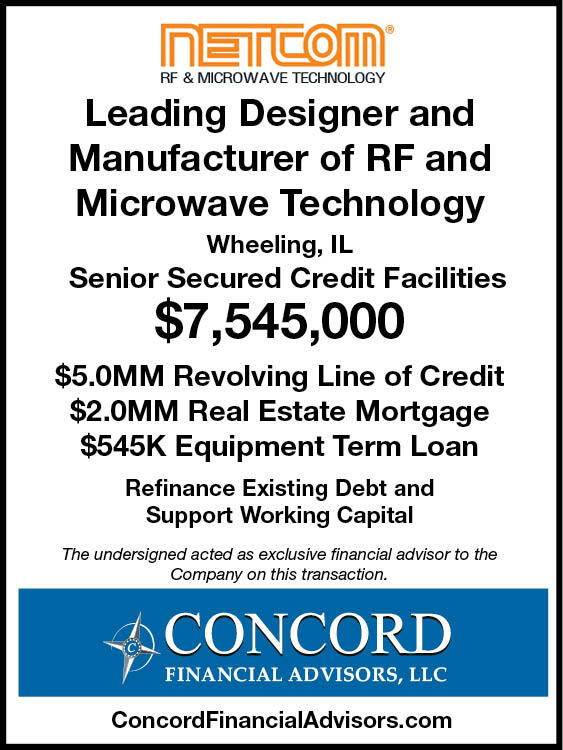 Concord negotiated a creative and attractive loan structure with a National ABL Lender that understands our business. 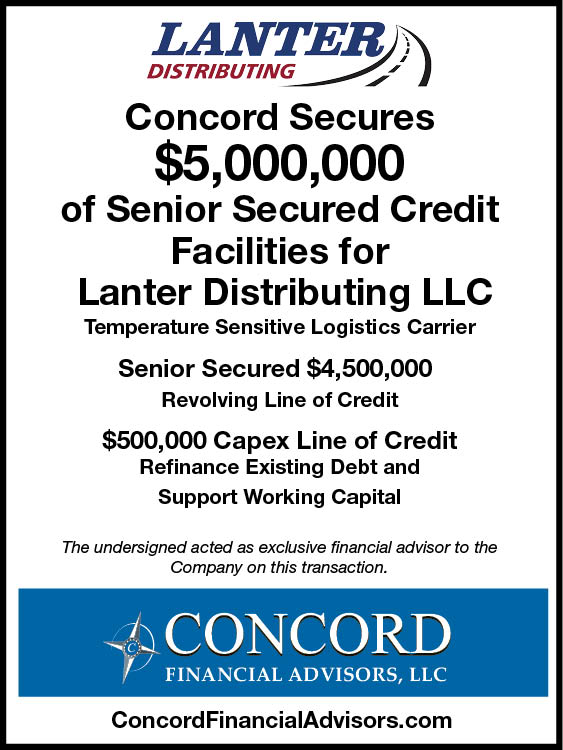 We are very happy with our new bank and with Concord’s services. 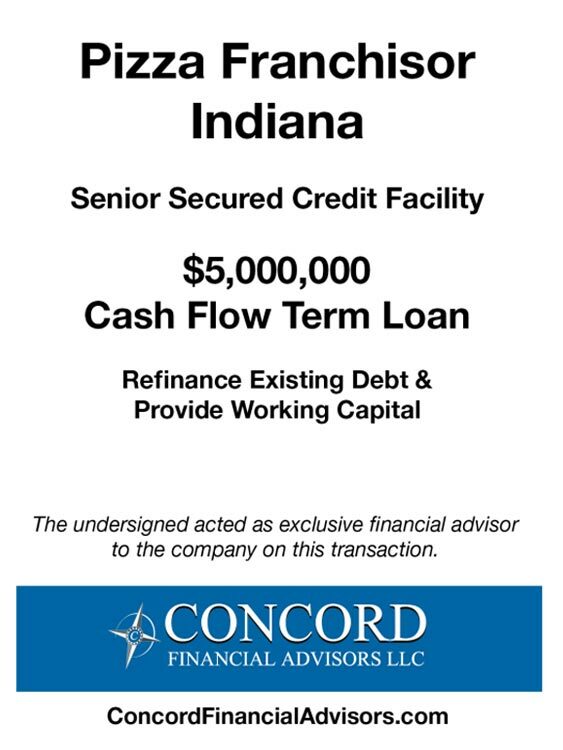 Concord saved us a significant amount of time and money by quickly identifying qualified lenders that understand our business and negotiating the terms and structure of our lending arrangement with our new lender. 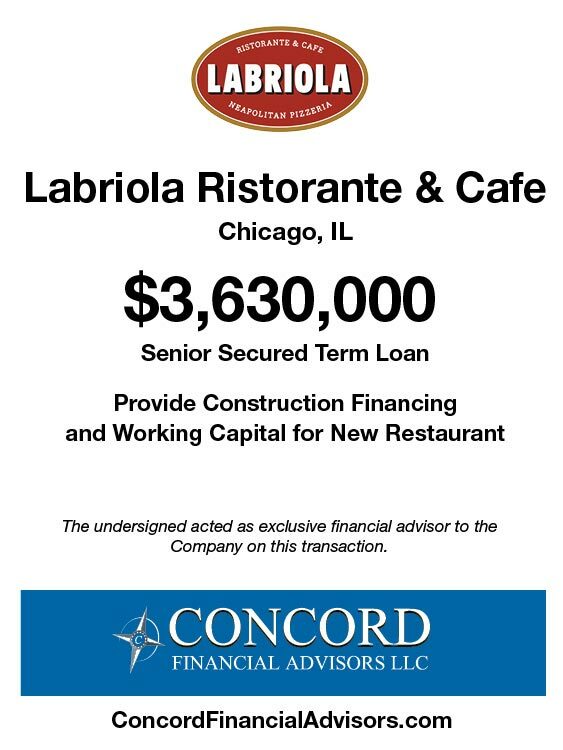 We are very pleased with our new lender and thankful that we hired Concord. 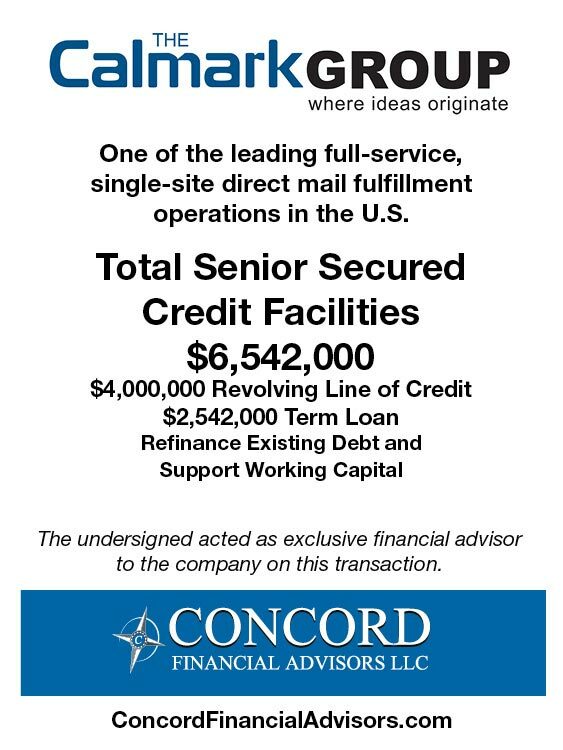 The professionals at Concord provided a true value-added service to our Company in our search for a new banking partner. 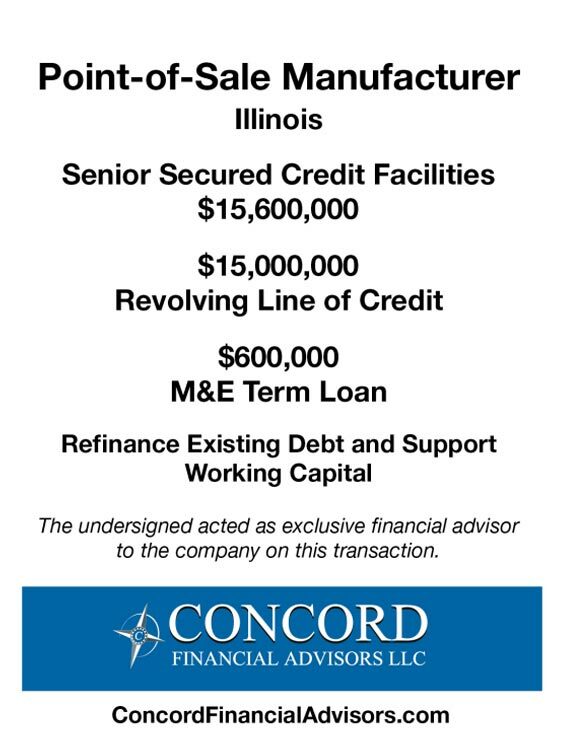 Concord took the time to learn about our business and became extremely adept at helping us tell our story to prospective lenders. 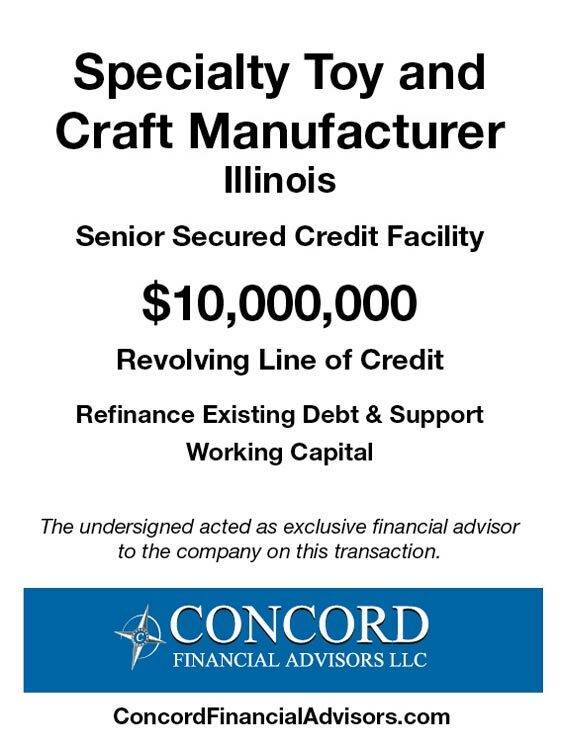 The process was efficient, saving our management team significant time which allowed them to focus on the business. 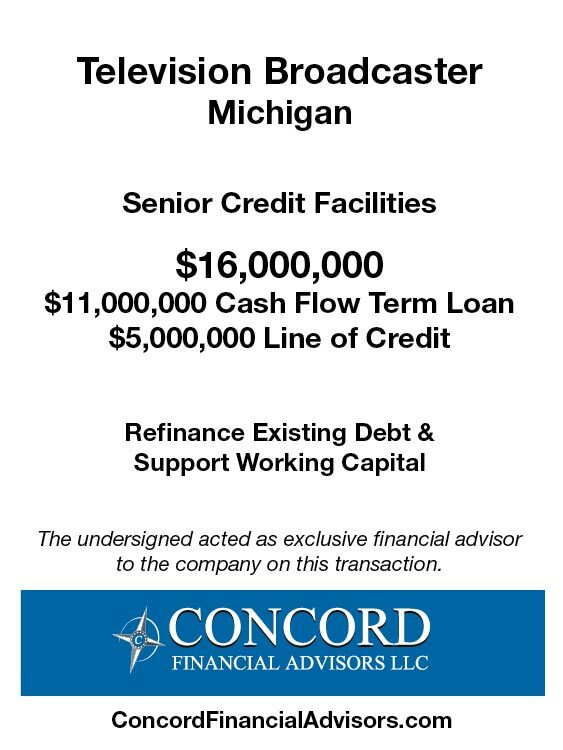 Concord’s knowledge of the market and deep database of debt providers assured us that we were getting the best possible deal the market had to offer. 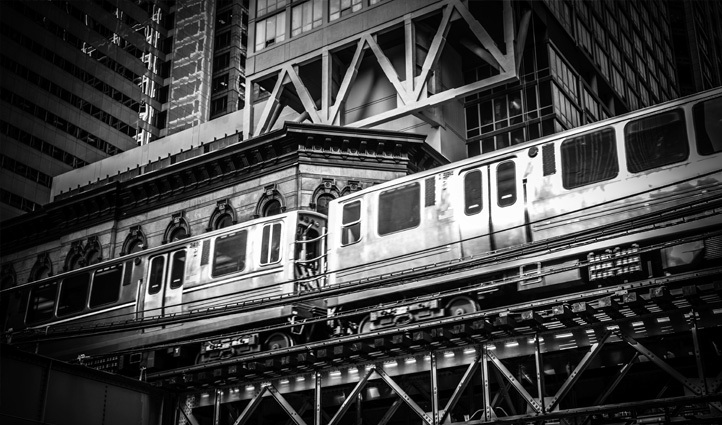 Your deal with the marketing services company? 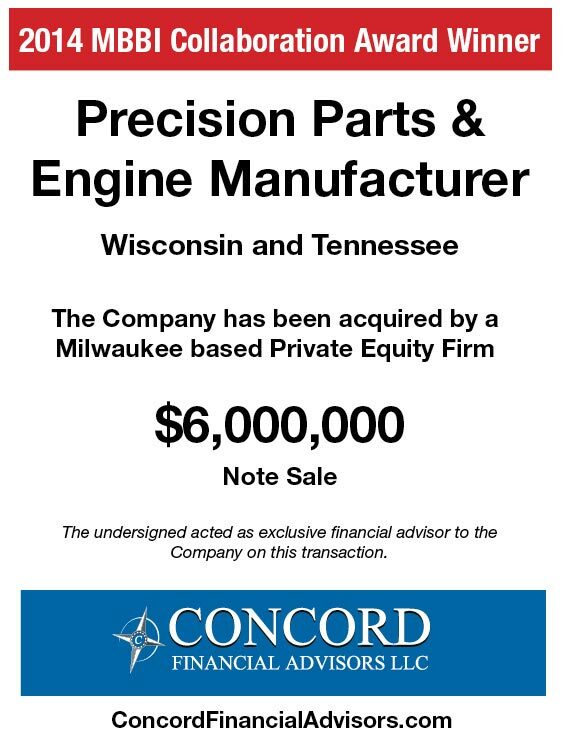 That was the Miracle Deal. 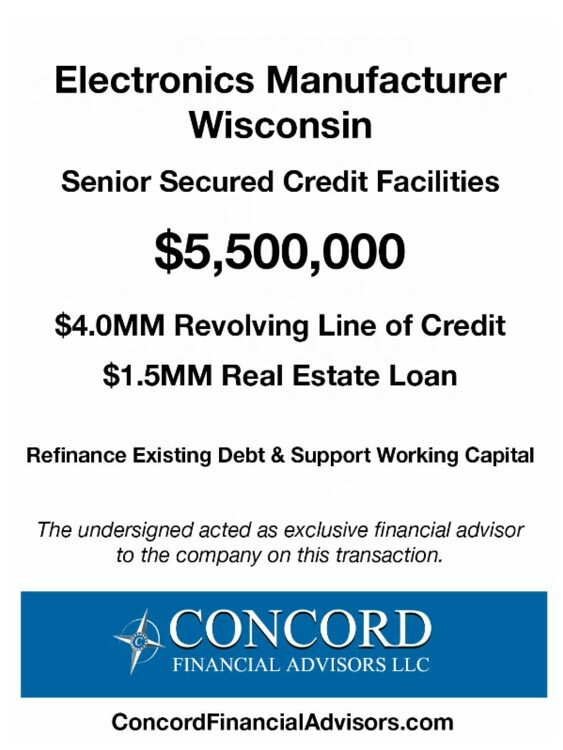 Concord’s laser focused approach and strong relationships with multiple qualified banks quickly identified the right lender to handle all of our financing needs, saving valuable time and money. 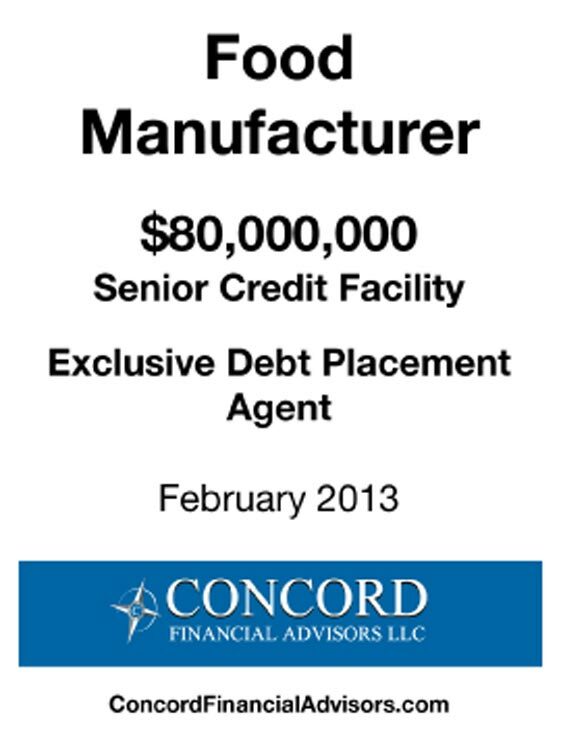 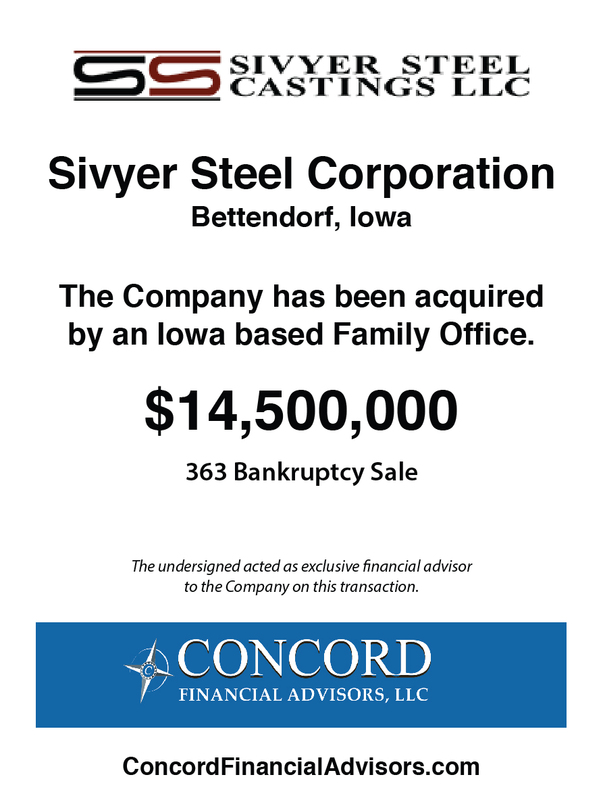 I highly recommend Concord to companies looking for debt financing. 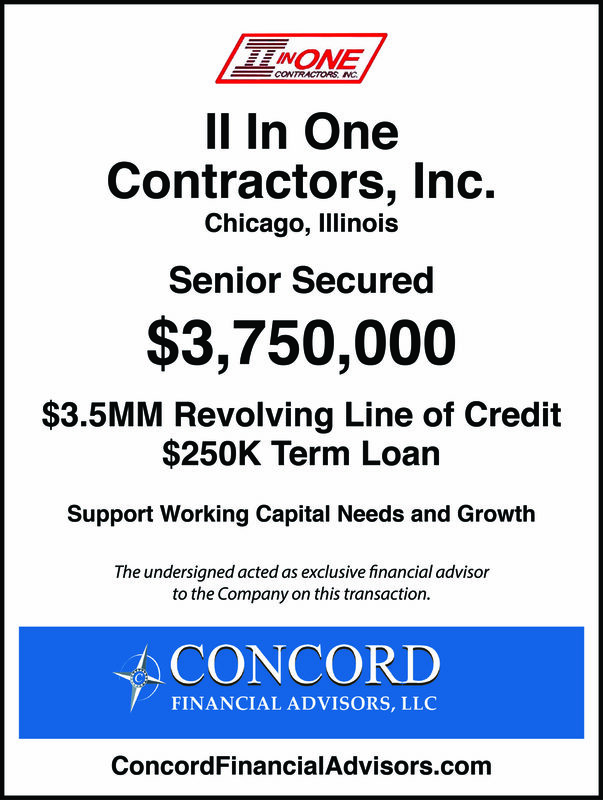 Tom Jones and the Concord team used their analytical skills, industry savvy and well-developed relationships to guide ARI in selecting the best partner to meet our financial needs. 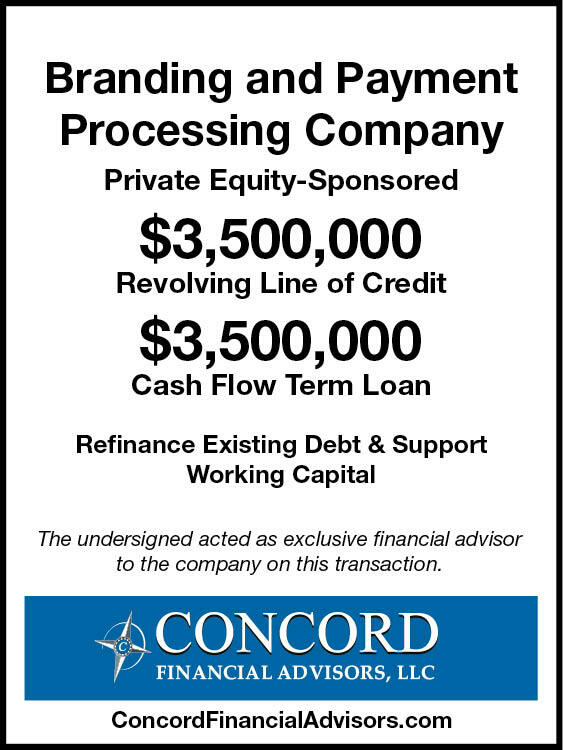 Working with Concord Financial Advisors, LLC allowed us to not only meet several lenders whom we did not know, but also allowed us to run our business while Concord found us ‘the right lending partner’ who understood our business and met all of our refinancing objectives. 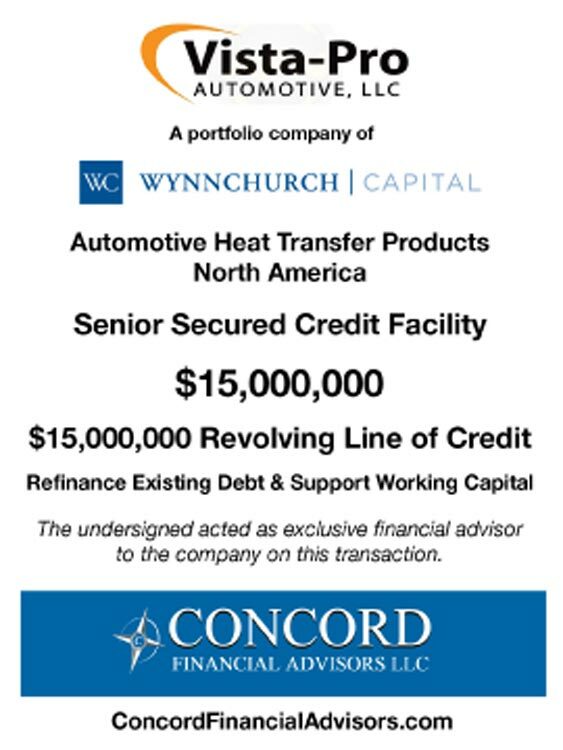 Concord saved us a lot of valuable time and they negotiated a very favorable transaction for us too. 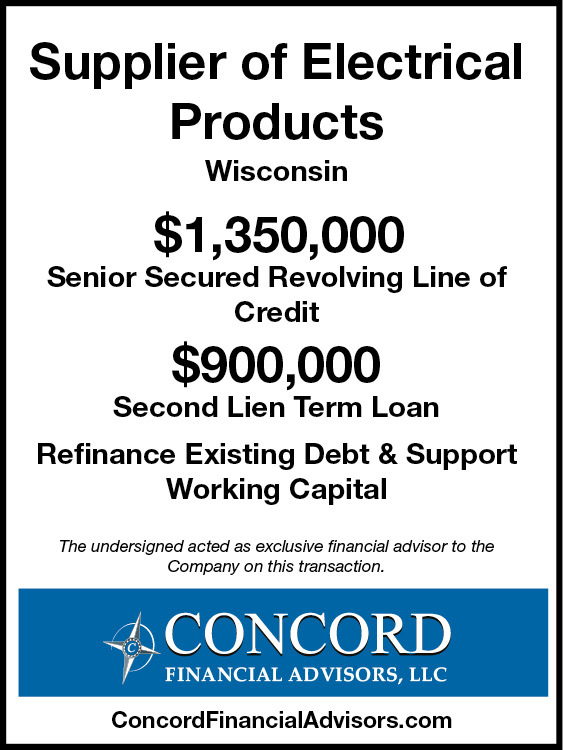 We are very pleased with our new lender and with Concord’s results.